Washington, D.C. – Never one to shy away from controversy, but often accurate assessments of fact, Ron Paul—who rose to prominence with presidential runs in both 2008 and 2012, running on an anti-war, pro-civil liberties message—made a monumental statement about the current state of the extremely dysfunctional U.S. political system, during an interview with the Washington Examiner, and noted how that could benefit libertarians in 2020. The “us” Paul is talking about is the libertarian movement, as Paul is perhaps the most prominent ideologically libertarian voice in the world. The libertarian thought leader told the Washington Examiner that while he does not foresee the United States breaking into separate countries like the Soviet Union did, he does expect the coming systemic collapse to include an end to our currently unsustainable monetary policy and an end to the global “empire” maintained by the U.S. military—with over 800 bases operating in over 70 countries. Paul presciently noted that “the country’s feeling a lot better, but it’s all on borrowed money” and that “the whole system’s an illusion” built on corporate, personal, and governmental debt that will never be paid back. “It’s a bubble economy in many many different ways and it’s going to come unglued,” he said. 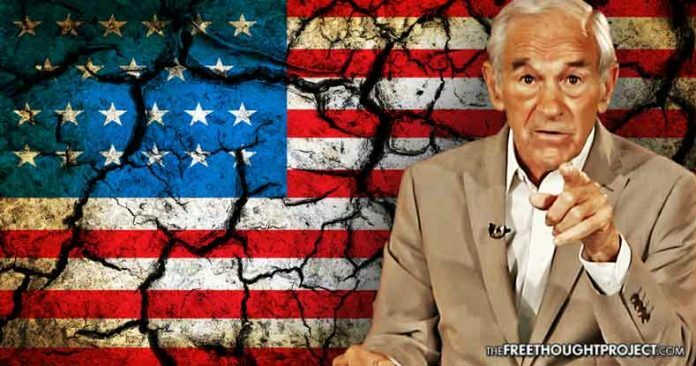 Paul calls the Federal Reserve “the chief culprit” in the financial crisis of 2008, and says the Fed’s willful printing of more currency under the guise of “quantitative easing,” or whatever other fancy name they use for printing money out of thin air, creates “boom” and “bust” scenarios which have eroded the value of the U.S. dollar to record lows amounting to a total loss of 96 percent of its value. Paul went on to note that he disapproves of Trump’s foreign policy, in particular, his handling of the North Korean nuclear crisis and his staunch support for Saudi Arabia—who Trump, prior to becoming President, intimated on video was possibly behind the 9/11 WTC attacks. “I think the foreign policy is a total disaster. Trump’s approach sounds good one day but the next day he’s antagonizing everyone in the world and thinks we should start a war here and there,” Paul told the Washington Examiner. In a tweetstorm during a Trump speech back in February, Ron Paul laid waste to Trump’s warmongering and hypocrisy. After running for the presidency on a platform that included getting the U.S. out of NATO, Trump—like all politicians do—switched his stance and began to promote it as a historic alliance. “We strongly support NATO, an alliance forged through the bonds of two World Wars that dethroned fascism,” Trump said. The former congressman has a way of presenting the facts in a clear and compelling manner that is often extremely difficult to refute. Paul said that he continues to view the U.S. as on a steady path to fascism. Sadly, many former Ron Paul supporters jumped on the Trump bandwagon, as they perceived him to be an outsider running against the status quo. As Paul describes it, the appearance of Trump has been a setback for the libertarian movement, but he maintains hope for the near future. 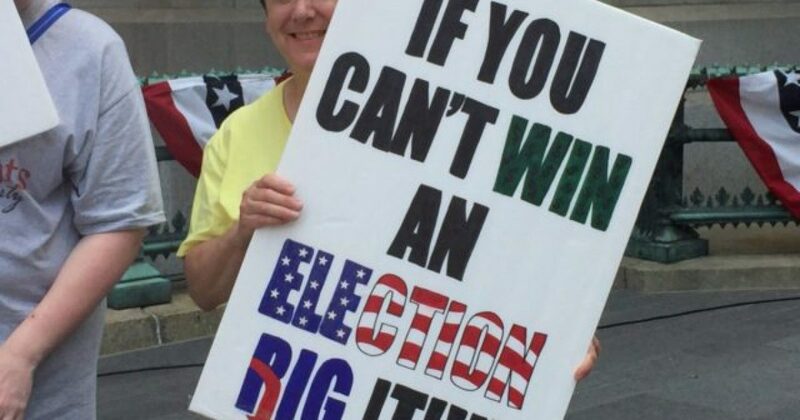 “If they only hear our message, I know they would choose liberty and sound money and freedom and peace over the mess we have today,” Paul said. Perhaps breaking up like the former Soviet Union is not that bad of an idea after all.